Traveling, but not sure how to get to Menlo Park? Yellow Checker Cab will help you out! The finest yellow cab in the area, YCC is all about your comfort, great rates, gift cards, and the most extensive service area coverage you’ll find in this region! 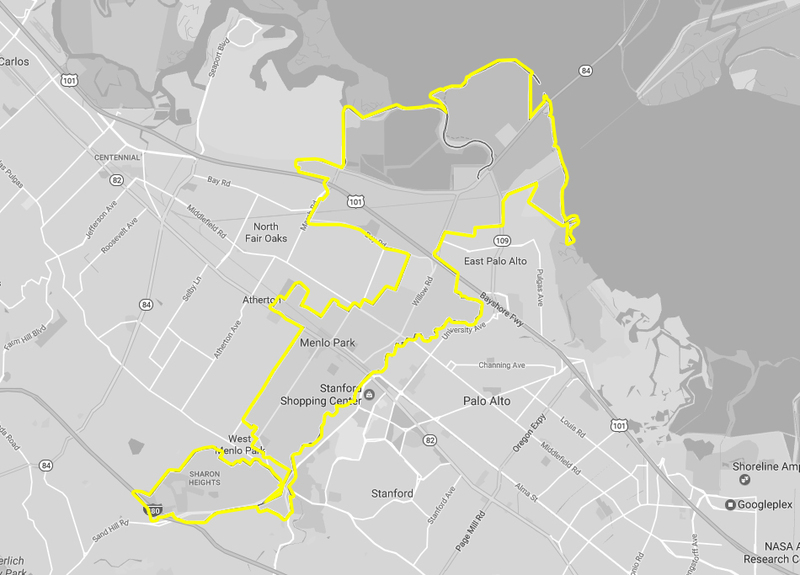 Where is Menlo Park located? Menlo Park is situated in the San Francisco Bay Area, with a population of approximately 34,357 residents. It is considered to be one of the most educated cities in the state of California and the United States, with nearly 70% of the residents owning a degree. In recent years, Menlo Park has also become known for the Facebook Headquarters, as the company moved there in 2011. On the list of top employers, Facebook is now followed by SRI International, TE Connectivity and SHR Hotel L.L.C. In case you are going to Menlo Park on business, explore the corporate account taxicab option with Yellow Checker Cab – it’ll make your travels easier, more comfortable, and far less stressful. What to do in Menlo Park? Art lovers should visit Allied Arts Guild, a lovely place with a beautiful garden, a cafe and an array of art shops where you can buy local artists’ work. Pace, Art, and Technology is the name of a perfect corner to go to when you want to try something different and new. It is showcasing technology-based art, including LEDs, image projection and virtual reality. There’s also an interactive section for kids and families. Menlo Park is a town with various open-air spaces, recreational facilities, tennis courts, and picnic areas, so you could fully enjoy your time outdoors. To make sure your whereabouts are handled the right way, why not have a dependable cab service close by, at all times? Yes! Yellow Checker Cab provides taxicab service near me, the way you always knew a proper taxi service should be! When you choose to activate Voice Command on your phone, just ask for “Yellow Checker Cab near me” or “taxi near me”. You will get a comfortable ride and a guarantee that you are arriving at your destination on time! Where to stay in Menlo Park? If you are looking to book an upscale accommodation in town, Stanford Park Hotel, Menlo Park Inn or Hotel Lucent could be a good solution. Travelers looking for more modest options would have no problem finding a property that would match their needs either, as there are various choices in that price range as well. There are numerous dining opportunities in Menlo Park, which is no surprise with all the different nationalities living in town and many residents enthusiastic about a healthy lifestyle. Those looking for gluten-free and vegan options in Menlo Park will find quite a few in the area, such as Evvia, Tamarine Restaurant, and Madera. When you crave a traditional American meal, head to Café Borrone or Jason’s Café and when you feel like indulging in Mediterranean or Greek cuisine, choose from Santorini, Opa! or Galata Bistro. There are various Asian cuisine choices as well, like Red Hot Chili Pepper or Garden Fresh Chines Vegetarian Cuisine. New restaurants and cafes are also popping up every now and then and as the area is known for innovation and creativity, then expect no less when it comes to the fine-dining scene. Fact is, Yellow Checker Cab chauffeurs will further enhance your experience by recommending the latest and hottest places so that you could choose one that perfectly suits your taste. Enjoy!